Sprinkle salt on the fish. Rub the salt on both sides of the fish and put them in wok. Add crushed 10 cloves of garlic. Add a medium-sized chopped onion. Add ½ tablespoon brown sugar. Add 2 tbsp soy sauce. Tilt the wok occasionally and use a ladle to spread sauce on the fish. Simmer until all Tilapia are fully cooked. When the fish’s white eyeball pops out, it means the head is cooked. 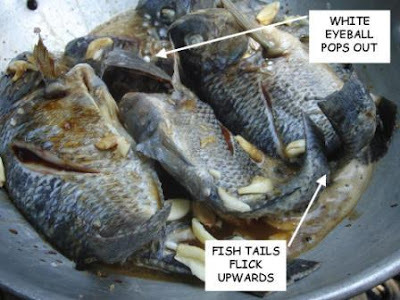 If the fish’s tail flicks upwards, it means the fish is very fresh.